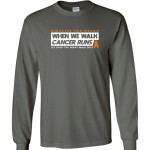 Buy a shirt to help bring light to the darkness of a blood cancer diagnosis! 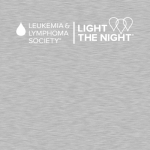 I am raising money as LLS's Light the Night Honored Hero this year! 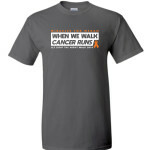 Money raised through the shirt sales will be donated directly to the Leukemia & Lymphoma Society in support of their mission to wipe out blood cancer. 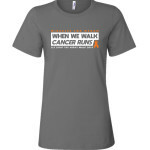 Orders will ship within 10 business days of this fundraiser ending on 09/14. for funding clinical trials and research in the fight against blood cancers. At 17 years old, I was diagnosed with high-risk, flt 3 positive, acute myeloid leukemia (AML). This diagnosis flipped my life upside-down. I went from dreaming about all of the fun things I would do in the last half of my senior year to dreaming about just sleeping in my own bed again, from competing in dance competitions to competing for my life every day. What transpired over the next two years included two bone marrow transplants, more than 200 days inpatient at two different hospitals, 34 days in the Pediatric Intensive Care Unit (PICU)—sedated, intubated, and on a ventilator, 20+ rounds of intense chemotherapy, and many other treatments too numerous to mention. Without the research that was funded by LLS, none of these treatments would be possible and I would not be here today. I'm asking that you please consider supporting LLS in any way that you are able. Money raised through Light The Night allows LLS to fund treatments for patients who are suffering from all forms of blood cancers. The impact of LLS supported research goes beyond blood cancers. The discoveries made in blood cancer research have led to break through treatments for many types of cancers and other serious diseases. I wouldn't wish what I have been through on anyone. Together, we can help defeat the darkness of cancer to eventually find a cure. Please make a donation today to continue to help people like me and those who receive a similar life-threatening diagnosis! Fund cancer research! & Megan Heeringa is the sweetest person on earth. 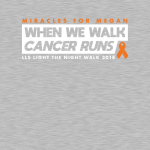 We have a special connection with Megan and her family and it’s a great cause!!! I support Meagan Heeringa and other children suffering from childhood cancers. I am supporting this campaign, because I am passionate about advocacy for the cancer community. Light The Night is a great event, and I'm proud to support Megan and the push to find cures for blood cancers. Go Miracles for Megan! We will find a cure! !